My legs were too dead for a proper workout on Saturday so I took a day off from training. With a whole afternoon of free time, I went to downtown Toronto to do something which I'm very good at: wandering around aimlessly in less than ideal weather and eating stuff along the way. One of my stops was Crepes A Gogo on Yorkville Ave.
As much as I love French food, I do feel a bit weird out for "theme eating" and I must admit that I committed that embarrassment big time. The weather was cold, windy, and humid. I was obviously underdressed for the outdoor but out of pure coincidence, I had a hat in my purse. Of course I made the logical decision to pull on my hat. Well, except the hat in question was a beret. So perhaps you can imagine me blushing in self-consciousness as I walked into this very French creperie, completed with a bicycle parked out front flying a French flag. To make things even more, ahem, interesting, the owner greeted me in French and asked if I wanted to eat in or take-out (en francaise, bien sur). Before I even processed what was going on, I already blurted out my reply in French. I felt like the biggest poser as I sat down at my table...if only I could hide behind the menu! 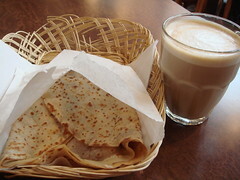 I ordered the house specialty "Big Ben" crepe and a mug of cafe au lait. I typically would only get the sugar & butter crepe at any creperie because it best showcases the quality of the crepe itself. However, I was intrigued by the salty-sweet combination of mozarella cheese and raspberry jam. It was a very tasty combination in the first few bites though it got too rich for my taste soon. 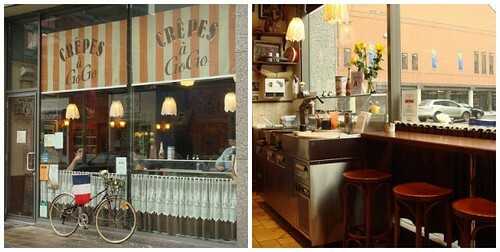 All the crepes at this restaurant are made to order (unlike Cafe Crepe on Queen Street West) and I have to say Crepes A Gogo makes my favourite crepes in Toronto. The crepes are tender and slightly stretchy. I particularly like how it's a little browned on both sides without turning crispy. As I was about to leave, a girl at another table stood up to put on her jacket and hat. Well guess what, her hat was a beret in bright red! The sight of her jaunty hat instantly made me feel better and I walked out of the restaurant with a full tummy and a smile across my face for more reasons than one. One foot. That's the difference today between a normal drive to work and an auto collision. The traffic signal at the intersection near my house was malfunctioning so there was some backed up traffic. The left lane was all congested but I was clear to go on the right lane. As I pulled my car slowly up to the intersection, I approached an entrance to the gas station on my right hand side. When I said slow, I'm talking about under 20km/h slow. Well, what do you know, this huge SUV from the opposite lane decided that since all the cars on the left lane were yielding, it would stomp on the gas pedal to make a fast left turn into the gas station. I put my foot on the brake immediately and there wasn't even enough reaction time for me to honk. Fortunately, my car came to a complete stop with just one foot to spare when the SUV was smack in front of me. I was sufficiently shaken by this close call. If a collision did happen, I know full well that the driver of the SUV would be at fault. However, that's really no consolation because it would still be a bad collision!! I typically don't mind driving but this was certainly one of those occasions that I think teleportation is a fantastic idea. Feeling very French lately! I made this goat cheese onion tart with the other crust (the package comes with two rounds). It is filled with caramelized onions and a layer of savory goat cheese cheesecake (really!). The lovely golden colour comes from slow long baking. Mache is one of my favourite salad greens because of its texture and slightly nutty flavour. I think it is a great match for the tart. This tart is very easy to cut (neat neat cuts without effort) and it is delicious at room temperature. Although it is snowing outside, I just want to take it out to a picnic somewhere with a bottle of lemonade and some cherries. You can see from the picture below what the tart looked like when it was fresh out of the oven, cooled down to room temperature, and finally ready to serve. Unroll pie dough to a 11" ceramic tart plate. Prick and bake according to package direction. In a large skillet, heat 1 tbsp of olive oil. In medium high heat, slowly cook the onion without disturbing them often so that they caramelize to a deep brown colour. Spoon onion to baked crust. In a mixing bowl, use the paddle attachment to mix goat cheese, butter, and sour cream until smooth. Add eggs one by one until throughly blended. Add salt and pepper to taste. Pour the custard over the onion and smooth with an offset spatula. Bake for about 50 minutes until golden. Cool to room temperature and enjoy! I don't know why but I had quiche on my mind in the last couple of weeks. 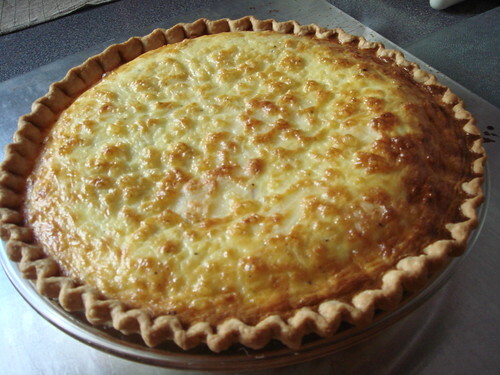 Being quite familiar with the techniques of the sweet kitchen, making a quiche is really no big deal. It's just a savory custard in a pie crust. Let me just say this up front: this quiche tastes awesome. Instead of the typical dried out chewy filling, this is creamy and smooth through and through. T ate a quarter at one sitting! Unroll pie dough to a 10" glass pie plate. Crimp the edges. Bake according to package instruction. Preheat over to 425F. Reserve a handful of the grated cheese. Evenly spread the cheese and ham over the baked pie crust. In a medium mixing bowl, whisk together eggs, milk, and cream. Season with salt and pepper to taste. Pour custard into pie crust. Sprinkle the reserved grated cheese over the custard. Bake for 40 minutes until golden and pouffy. The quiche is done when you don't see any liquid jiggling. DN recently came back from a trip to Japan and bought some cool toys. This is one of his purchases which I find highly amusing. Too bad it really doesn’t do anything other than entertain. Think of the possibilities! It could have been such a cool devise for email/IM notification. In the very least, how about a USB drive? It's been years since I first walked into the Fluevog store on Queen Street West. As much as I love their shoes, the price tag was something which stopped me from actually owning any. Yesterday I bought my first pair from this maker at last. When I saw the Body Parts Pump on their website a few days ago, it was love at first sight. The anti-AIDS message etched onto the sole of the shoe left a strong impression: Your Body Parts Are Not Communal Property. However, it was really the sexiness of these shoes that I could not forget. 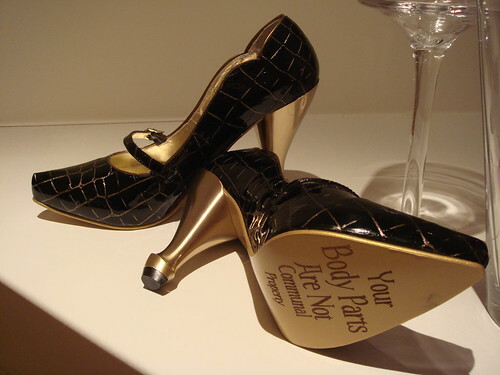 I absolutely adore the gold detailing contrasting with the shiny black patent leather. I have always had a weak spot for maryjanes. The low cut of these shoes also shows a bit of toe cleavage. I have been in search of a pair of sky-high heels (nothing less than 4" would do) that I could walk in and I think my search is now over. With a concealed platform and padded insole, I can dance all night in these shoes! The sensible thing to do is to wait for an occasion to wear them. However, I really don't think sensibility can possibly be related to such a gorgeous pair of heels in any shape or form. I will wear them, just because. Today has been a rollercoaster of emotions for me but I am glad that I have now settled on feeling stronger than I've been in many weeks. The wise words of AL have finally taken meaning even though those are things that I know all along. I believe in my gut feeling again, something which I compromised far too long. So what exactly was the magic bullet? I tried to imagine what life would be like with him 2, 5, 10 years from now. I know that I simply cannot live like that. As much as I may seem confused of what I want in my life, I am very clear on what I don't want. In the last ten years, I work very hard to become who I am today. I seek out opportunities to broaden my horizon and I face challenges head on even though deep within, I am scared and uncertain. I experienced great losses yet I am blessed with the strength to carry on. In my limited capacity, I strive to become the best that I can be. Those are all important values to me which I cannot compromise. I know that a healthy relationship should involve mutual respect and bring out the best in each other. He or she should be a person who helps me grow and grow with me. For the time being, it doesn't matter to me anymore what he does. The chain that he held onto my emotion has been temporarily broken and I am feeling free once again. I will try to hold on to this freedom for as long as I can...I'm really tired of crying already. I went to J-Town yesterday and came back with lots of junk food. I guess that's my retail therapy. 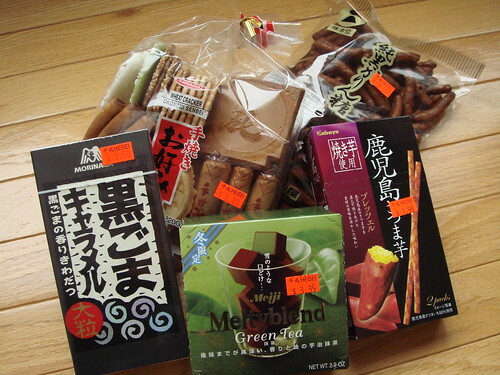 I bought a box of limited edition green tea flavour Meltyblend, some roasted sweet potato cookie sticks, black sugar crunchies, assorted sembai, and soft chewy black sesame caramel. All of these junk food has some sort of personal significance to me. The simple act of buying them and bringing them back home seem to make me feel a little better though a very sad at the same time. What's not helping is the fact that it was exactly a year ago this weekend when I confessed to him in my usual direct fashion that I like him very much. I obviously can't eat any of them. I'm going to have to look for a good home for my new purchases. I unwisely re-read some of the old correspondences, especially the ones we exchanged in the midst of the first break-up. I am really heartbroken. There were goodwill and intentions to work things out. None of those was present this time around, only animosity and hostility. He made it clear from get go that he wanted out and how keen he is about moving on. And now he's shown me how he already moved on. I know that all these boohoo'ing is making my loved ones worry. However, I really do need to rant and I am really heartbroken. It takes time for me to get well...a long and painful period but I have no doubt that I eventually will. I understand the good intention when I'm being told that he is not worth it. However, I really can do without the extra stress of feeling that I am not even ALLOWED to be sad. I am a slow one...it takes me a long time to undo all the emotional investment that I made in the last year for caring about another person so much. Please support me in this difficult time but hold off your judgement until I get stronger. Trust me, I know. I really do. My worst fear has come true. No wonder he is so keen on moving on. I am deeply hurt by everything that ever happened. I guess I'll figure out what to do after I'm done crying (but the tears can't seem to stop).